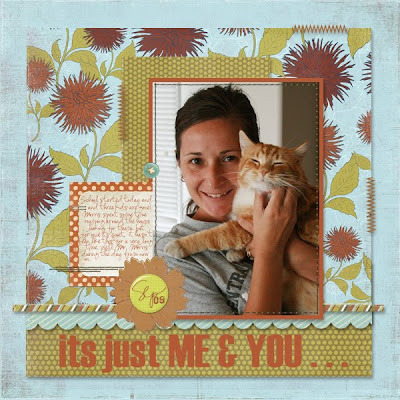 Its been cold, windy and rainy the last couple of days so I was able to sit inside a create some new digital LOs...this first one is about me and our cat MORRIS - on the first day of school when ALL the kids were finally gone...Morris roamed and roamed throughout the house looking for them - it was just TOO QUIET...and he couldn't figure out where they went. Credits: Fall Florals Digital Kit by Jessica Sprague, Bunches of Borders, Lots of Labels, Funky Flair Buttons and Au' Natural Elements by CreativityByCrystal all available at JessicaSprague.com (I also used my favorite date stamps by Karla Dudley). And this LO is my October LO for "Celebrate the Seasons" over at 2Peas. 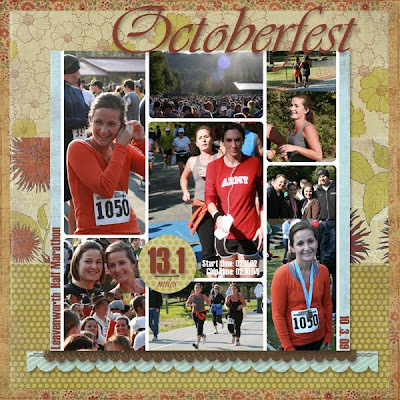 I decided to use photos of my 1/2 Marathon that I ran earlier in the month. This LO is based off a sketch by Nichol Magouirk. Credits: Fall Florals Digital Kit by Jessica Sprague, Rounded Corner Templates and Bunches of Borders by CreativityByCrystal all available at JessicaSprague.com (the staple I used came from ShabbyPrincess).